Scream 4 was supposed to be something wonderful. The master, Wes Craven, supposedly back at what he does best with characters that he knows so well. Kevin Williamson again the scribe, writing again revitalizing the series that he and Craven together created. Scream 4 opened very strong. The first 10 minutes of the film feature several cameos and a sequence that could perhaps define the term “meta.” I think that Williamson realized this as well and liked the thought so much that he actually worked the term “meta” into the script as a joke later in the film. The cameos are worthwhile, but I think to some extent, pandering to a bigger box office draw. Anna Paquin will draw the True Blood and The Piano (heeheehee) crowd and Kristen Bell the Veronica Mars, Gossip Girl and loads of other geek friendly fare...hey, I can call the name because I'm in the crowd! Williamson's meta joke missing the mark was exemplary of so many of the problems with the humor...just missing something or another. I am sad to say that much of it was timing, which falls in part to the actors. Courtney Cox and David Arquette have both been extremely entertaining and funny in the past, but not here. But wait, Reel Rhino, why should these folks being funny even matter…this is a horror film! Comedic undertones were a huge part of the first three films of this series and this combination of laughs and scares is what has made these movies so successful…up until now. 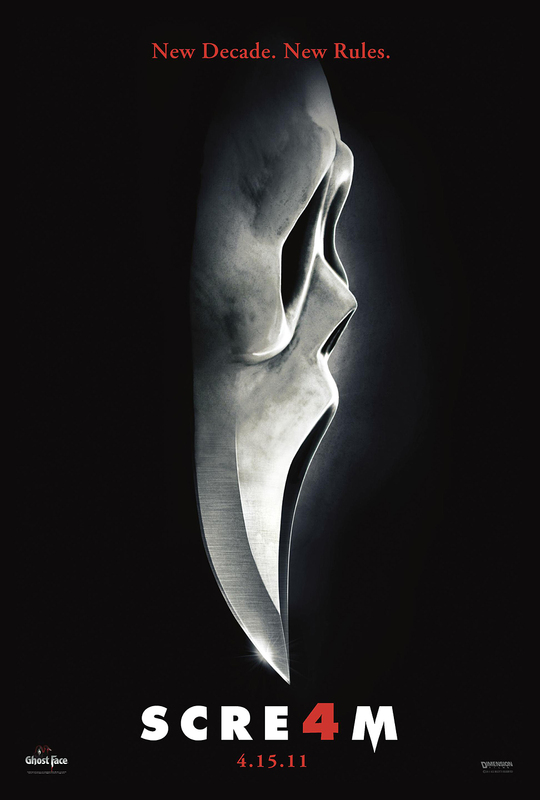 We join the action in Scream 4 with the return of the iconic Sindey Prescott (Neve Campbell) to the iconic town of Woodsboro. She is in town for her book release, a story of survival and creating a new sense of being in the aftermath of tragedy. Campbell is subdued throughout the film, even in the moments of terror that she experiences that one would think should result in some kind of a rise. Perhaps she (Prescott) is jaded to the thought of having a knife lunged towards her. Perhaps it is her continued ability to place so perfectly escape kicks, just barely eluding that dastardly villain, Ghostface Killer. But for this returning cast, none of the primaries, Campbell, Arquette, or Cox, gave anything of substance to this film. As we are introduced to this world, Dewey is now Sheriff and Gale, his wife. Dewey demonstrates the same level of grace, or lack thereof, that he had in the previous entries. Gale demonstrates a great impatience with living in a small town. I think that Cox and Arquette are again an item off-screen, but there was little chemistry between them on-screen. There was certainly nothing coming close to the believable awkwardness that made them an enjoyable and unlikely pair from the first set of films. There is a new generation of high school students, the main character of which, Jill Roberts (Emma Roberts), is Sidney’s Cousin. We get also Hayden Panettiere of Heroes fame, a hip young actress, sporting a not-so-flattering short hairdo that is millimeters away from 100% pure mullet. Roberts and Panettiere are just two of the fresh faces that populate this new version of Woodsboro. The faces are new, the story is not. Other than adding Twitter, Facebook, streaming video, and non-stop texting by all of the younglings, this is the same old story, rehashed. I was bored by this movie. One of my chief complaints is that while red herrings were a plenty, there was barely a single time that someone dropped into perceived peril, that they weren’t actually engaged and/or killed by our villain. How can you build suspense if you don’t juke right at least once, but actually drive left for the hoop? At various points throughout the film, as the previous entries have done, the movie-geek world was called upon in practice as well as in dialogue. It was continuously referred to that with a new series, the stakes are higher and the outcome would be crazy. I would argue just the opposite. Craven offered us nothing new but a little bit of technology. And how does that make this so fresh? I mean if you did everything the same as in 1996, you would essentially have created a period horror film. Of course kids are going to be texting…that isn’t enough to woo me into loving this film. Generally speaking, the ending was watchable, but I think only because with all of these films, you have little to no legitimate foreshadowing to guess how it will end. I mean for all intents and purposes, at the end of any of these films, they could make the killer Glenda the house maid, who was otherwise until the moment of the reveal, an unseen character. A few lines of witty dialogue would explain it. Worry not, movie goers, I didn’t just spoil the ending for you, but rather I am pointing out a weakness of horror films today. I love horror done right. This is not horror done right. More specifically, I was shocked at how wooden Emma Roberts came off throughout the film. I have enjoyed her previously, see also: It’s Kind of a Funny Story and Lymelife, both indie dramedies. She has talent; it just wasn’t featured properly here. I don’t think Auntie Julia hasn’t done much horror; maybe it isn’t in the blood. Papa Eric has done a few genre flicks, but they weren’t scary for the right reasons. Perhaps the young Roberts should stick to indie cinema? You know what I did like, though, was Marley Shelton. She played #1 Deputy Judy Hicks and besides being one fine looking Deputy, she was also just the right amount of campy fun for a horror movie. She last bedazzled me with roles in the double feature of Grindhouse: Planet Terror by Robert Rodriguez and a smaller part in the Tarantino directed half of the flick, Death Proof. She was stellar there and she is something resembling stellar here. As a final note, while this R-rated film still lacked the "T-and-A." that is a welcomed benchmark for designating truly great horror (tongue…meet cheek), Craven did manage to ratchet up the blood and gore. It was really waster though, as pretty much everything was wide of the mark. I give this movie a 1.5 Horn rating, out of 5 Horns possible. Not so great considering the generally positive reviews it has received so far. I think by week’s end, that RT score will fall…just overnight it slid from 63% to the not-as-fresh score of 58%. Here’s hoping there is something better in store for Reel Rhino this weekend. I need to wash this film from the forefront of my movie mind. Disagree with me…let me hear about it…comment below. Rhino’s have thick skin…I’ll survive. My plans to also catch Robert Redford's THE CONSPIRATOR were dashed by a sold out show...something I haven't had to worry about in quite some time. I think that is a good sign for the theater business, but a bum deal for me. I saw Born to Be Wild instead, the Morgan Freeman narrated IMAX documentary, and for as short as it was...40 minutes...it was pretty awe-inspiring. That's all for now...until later...take care. Scream 3 had Jay and Silent Bob, that alone makes it superior to S4. That said, your negative review aside, I want to see this one.